Are you forever sweeping up spreading litter crumbs? Here are some simple things you can do to make cleaning easier. Our cats are superior to stinky dogs because they are self-cleaning – they wash and toilet themselves. But as dedicated guardians, we are left to deal with the litter tray (which in comparison to cleaning up after a dog is still pretty good). Use these tricks to make your #litterlyf that little bit easier. Cats love creeping into hidey holes, especially for going to the toilet! We’re all a bit vulnerable when we’re using the toilet, so being in a small enclosed space helps your kitty feel safe. Plus, the litter is completely contained! Buy a cheap cabinet from any furniture store and leave the door propped open slightly or cut a cat hole in the back for entry/exit. 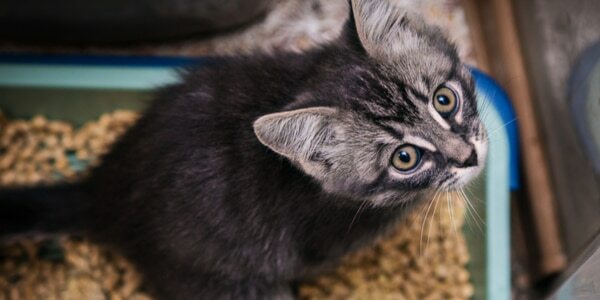 For a cost-free option, you can even use a cardboard box to make your own litter cabinet. Check out these ideas for inspiration. Not all cat litters are equal – some are light and crumbly while others are made of heavier crystals. Changing from a light litter to a heavier one can stop it from leaving the box when kitty is kicking it around. Plus, heavy litter crystals are much less likely to stick to paws and get tracked around the house. Litter mats sit next to the litter tray, collecting all the crumbs that would usually fall onto the floor. They come in foam, rubber and all sorts of other materials – this article reviews some top selling mats, and talks about the ins and outs of different types. As we’ve discussed, dogs are dirty and this extends to their tastes for snacks. If you have a dog at home and the litter tray is exposed, they are definitely eating out of it right now. Luckily, pups are big, clunky things so they are easy to lock out. You can use a covered tray, a cabinet, height barriers or put a cabin hook on the door so only kitties can slip through. Psst – is kitty having toileting problems? Here’s how to help them get back on track. Toileting problems come from an emotional event (something scary happened or is happening) or a physical problem (something in their furry bod just doesn’t feel right). When your cat is feeling vulnerable, they will do whatever they can to find safety, including taking shortcuts with the litter tray. For cats, quiet, private spaces feel safer: try giving kitty more privacy by cutting a cat-size opening in the end of a cardboard box and placing it upside down over the litter tray. You can also move the tray to a quieter place in your house. Combine this with using a calming aid like Feliway spray to bring the stress level down. If kitty was just being a scaredy-cat, this will help them get back to their clean, litter-loving ways. If the problem continues then it’s time for a trip to the vet. This entry was posted in Cat behaviour, Cat furniture, Cat health and wellbeing, Home organisation. Bookmark the permalink.